If you’re looking for the perfect winter room, then consider Arkay’s pergolas. These extravagantly named marvels of contemporary production are great at offering you a usable space throughout the year. 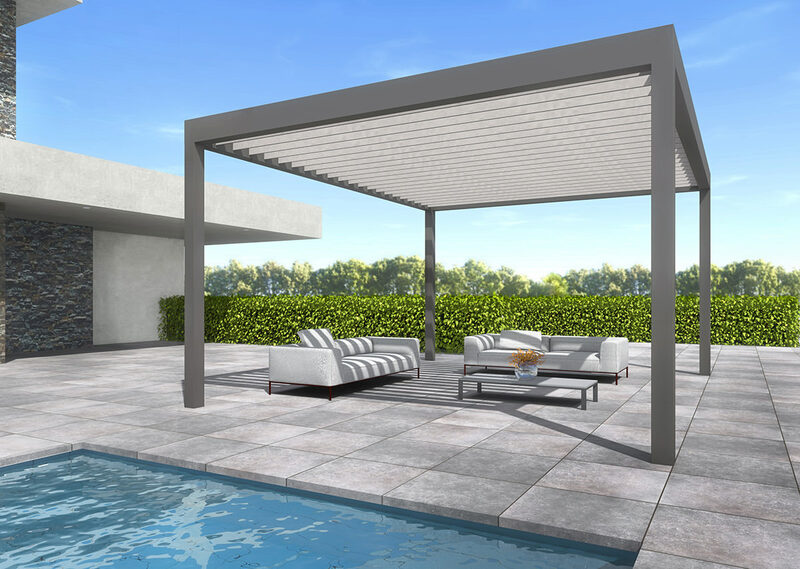 The optimal outdoor structure, our Pergolas can be designed to operate through the coldest winters and blistering summers in either an enclosed or open space. Constructed from the finest aluminium, these products make great garden rooms. We offer a variety of customisation options in the creation of our pergolas, from colours to hardware modifications. Furthermore, they are easily installed and are designed with a fully mechanical assembly method in mind, allowing the parts that make them to be easily transported. 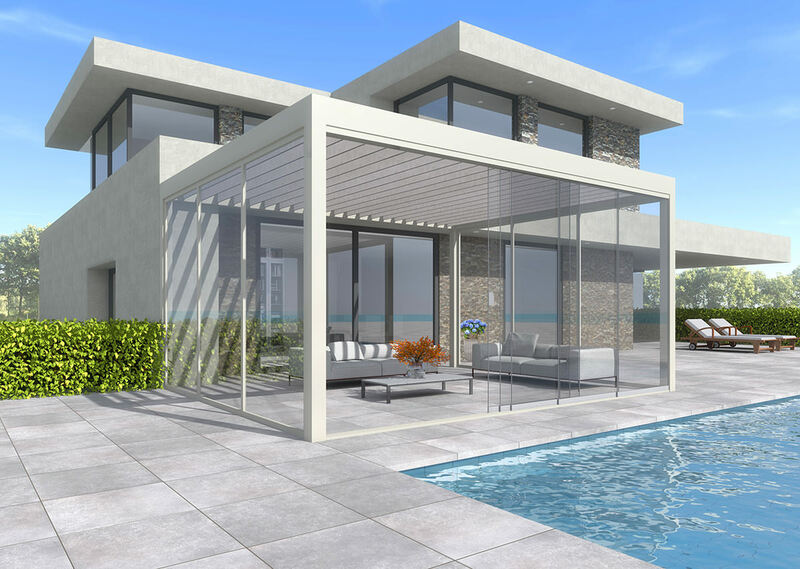 Our bioclimatic pergolas will bring your home roaring into the 21st century, with a stunning blend of slimline aluminium frameworks and large double glazing should you opt for such a design. Optional sliding doors and glass walls make you feel like you’re really outside, without having to actually suffer a cold winter breeze. Pergolas truly are the perfect winter room. This full aluminium construction is designed with the latest features in mind. Our roof blades can be motorised, meaning that our aluminium pergolas are truly a home improvement product of the future. Furthermore, if you really enjoy gadgets then this unique featurette can be configured to respond to commands provided via a Bluetooth connection with your mobile phone or tablet. 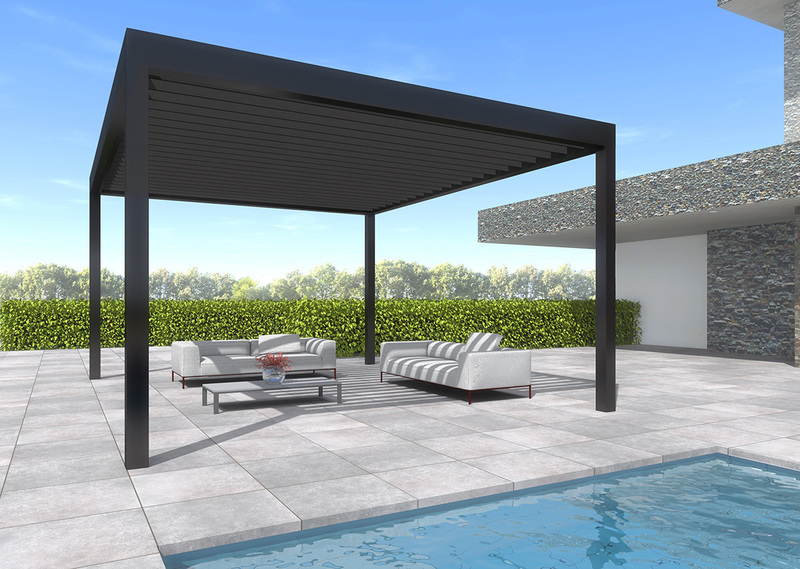 The rooftop of our aluminium pergolas can also include a series of masterful sensors which monitor and detect rainfall. In rainy weather, these incredible products will automatically close the roof shutters or covers, meaning that you don’t have to keep an eye on the weather 24/7. The latest integrated white or RGB LED strip lights will also create an exciting, yet homely, atmosphere. 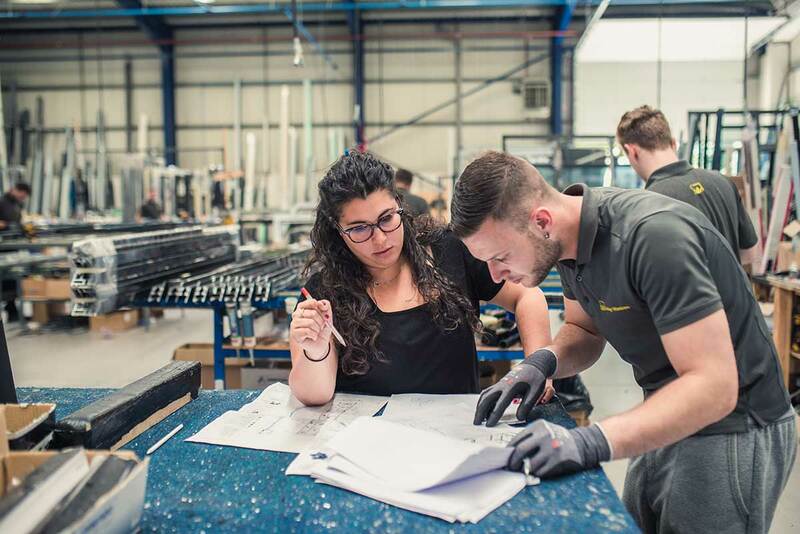 We utilise high-quality materials in the construction of our aluminium pergolas, which easily outclasses competing timber and uPVC alternatives in terms of strength and durability. Designed to maintain their premium state for years to come, these fascinating products end up being a low-maintenance and cost-effective home improvement that doesn’t require constant cleaning. 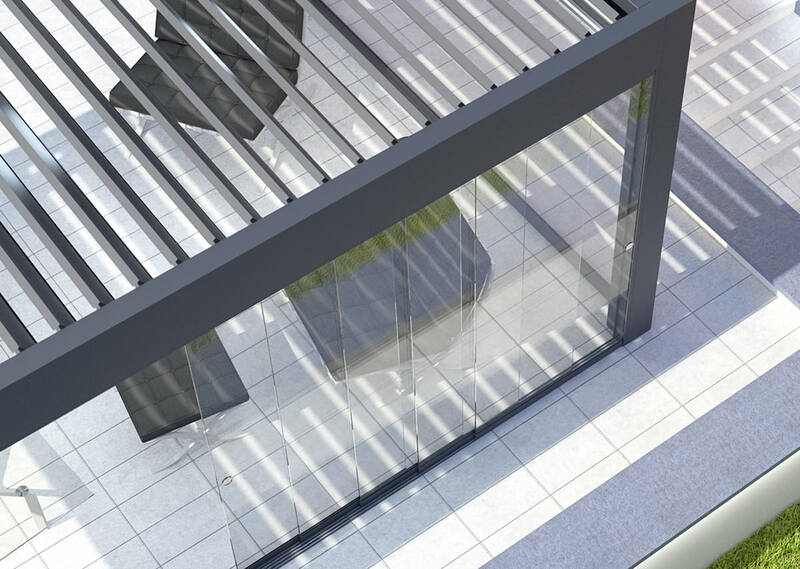 These are the reasons why aluminium is such a well-regarded material within this industry, and that’s why we’ve chosen it for our pergolas. As a leading name in the field, Arkay know good quality, and we’ve specifically crafted our aluminium profiles to be UV and rust-resistant, which means that warping, cracking, rotting and discolouring are nothing more than problems of the past. Our aluminium pergolas come in a variety of designs, each of which is tailored to the exact specifications of the homeowner. You will always have control over our products, and each comes with a durable polyester powder coating in a range of 7 distinct colours. We also offer a standard selection of over 100 RAL colours when it comes to colouring the frame and roof blades. Furthermore, you can customise the layout to suit any need. Are you looking for an outdoor lounge area for entertaining guests? A space to retire to during a quiet summer lunchtime? Whatever the intention, we can tailor our products to suit you with up to six metres of space to work with, or a maximum overall width and depth (post-to-post) of 6000mm and 4000mm respectively. If you want to accentuate the modern aesthetic feel of your home, then consider opting for our cantilevered or suspended configuration. This unique architectural design doesn’t require structural posts, and is easily one of the best ways to wow your guests and increase the market-value of your London property. It also fully embraces the status of your pergola as a modern installation. Beyond this, there are a multitude of reasons why our aluminium pergolas are a top choice. You can select from our collection of sliding doors and glass walls for a personalised aesthetic feel, as well as radiant heaters, an anti-freeze temperature of 2° Celsius and a max snow load of 70-85kg/m² for the perfect winter room. Concealed drainage, Qualicoating and so much more can be yours with Arkay. Experience what it’s like to relax within the perfect winter room by choosing one of Arkay’s fabulous aluminium pergolas. Designed for easy installation, maximised views and optimum temperature control, it’s hard to go wrong with this product-line. Check out our contact page to find out how you can get in contact with our team, or take a look at Better Outdoors to find out more. On the other hand, if you’ve decided that our pergolas are just what you’re looking for, then stay on our website and enjoy a free, no-obligation quote thanks to our pricing tool. This useful program works at the click of a button. Don’t forget to check out our Watford showroom where we have a huge selection of home improvements on display for people to view.